This is a herbal education program of the highest order designed to train herbal practitioners to build a career in herbal medicine. It meets and surpasses standards of training for professional accreditation across Canada. Most importantly, this course is designed to ignite your passion for plants and their use for lasting well-being. The curriculum will reflect the diversity inherent in herbalism. Herbal sanctuaries and farms, herbal laboratories and one of Halifax’s most grand heritage buildings with herbal teaching garden. 350 hours of clinical practicum included. 2/3 of the herbal study is dedicated to direct learning with and from the plants, which translates as in-the-field-study of medicinal plants, in various settings throughout Nova Scotia. In class study (with and without walls), with a team of experienced and inspired herbal teachers and other specialist in the field of medicine and well-being. Meaningful participation within the Bloom Institute community. 500 hours per year of study, spread over ten months, with breaks for the months of December and August. Classes are held once a month, for 4 days: Friday – Monday, plus two additional mornings on clinic days. Clinic practicums are held at various convenient times each month. There will be in the field, farm or forest intensives each year, in addition to regular shorter excursions among the plants. Research skills • Laboratory science: interpreting and analyzing medical diagnostic tests • Business skills • Plant Spirit Medicine • Aromatherapy • Flower essences • Study of additional natural health products • Study of additional complementary & alternative methodologies . Clinic practicum will consist of client / patient consultations, assessment, protocol development, remedy formulation, herbal dispensing, record keeping, follow-up. Herbalists are not regulated. Standards of education and practice have been established nationally and have been adopted by the various herbal associations in Canada, including in NS and NB. Herbalists who meet these standards become registered by their provincial association and receive all the benefits and support of such registration. Does the one year course apply as credits towards the three year program? Does the three-year program qualify for student loans? Does the three-year program receive professional accreditation? 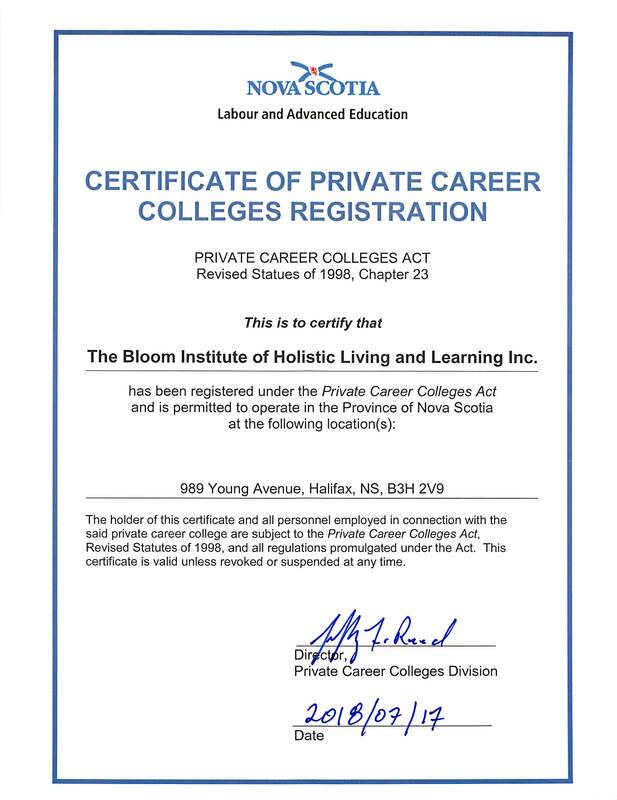 Yes, graduates are eligible to register as a professional herbal practitioner with the various herbalist associations throughout Canada and possibly abroad. Is the one year program a pre-requisite for the three year program? Are there other pre-requisites? The prerequisites are grade 12 education, beginner biochemistry and fluency in English. Prior herbal study, such as the Bloom beginner program is an asset, to verify the desire to delve deeper into herbal study. Is there tax charged on tuition? What is the difference between the one year and three year programs? The one year course is for personal interest, care of self and family, an introduction to herbal medicine. Practical, interactive, encounters with local herbs. The three year program is a professional diploma program to train herbal practitioners. What types of certificates/diplomas are given for the herbal programs? A diploma in herbal medicine is give upon completion of the Bloom Herbal Practitioner Program. A certificate of completion is given for the beginner program. Please be in touch if you are interested in further details and beginning the application process. I deeply appreciate your inquiry, it fuels my inspiration for the school, and my excitement about the future of herbal medicine. I look forward advancing the herbal movement together.